The Whitney Portal Prototype was commissioned by the National Forest Service to celebrate the 100 year anniversary of one of the most popular trails in their national network. The trail to the peak of Mt. Whitney rises 6,100 vertical over 11 miles and originates at the Whitney Portal, 13 miles west of Lone Pine, California. 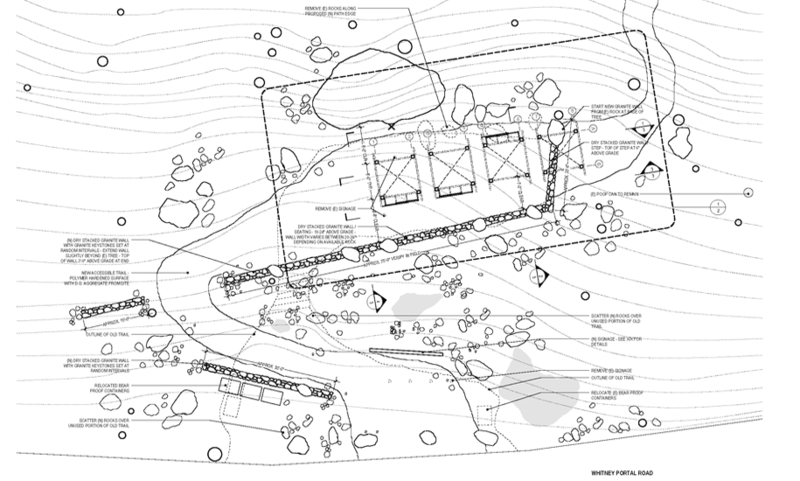 We approached the project as an opportunity to establish a significant and meaningful beginning to the trail where none previously existed, while also addressing the Forest Service’s desire to create a repetitive, easily recognizable structure that could be used at various sites to indicate trailheads. 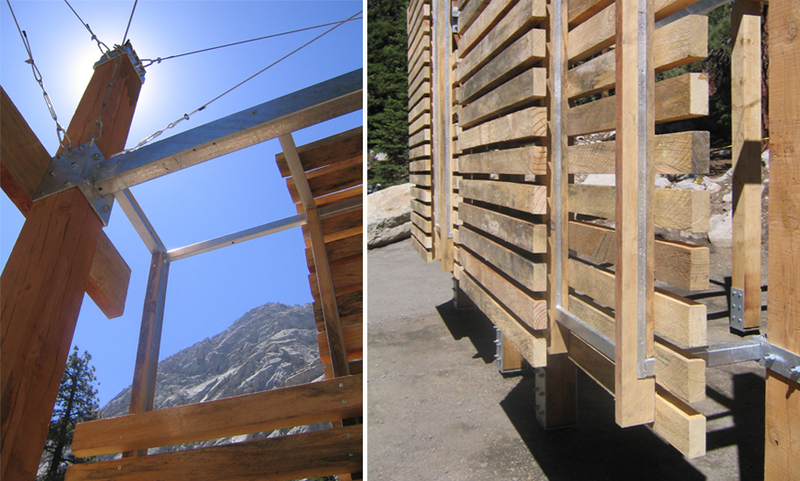 Our solution integrated a primary structural frame of large pine columns and galvanized steel cross bracing, plates and shoes coupled with a secondary screen of smaller pine members to provide sun shading and space for historical, ecological and safety signage. The bottoms of the pine columns are cut to adjust to the varying topography while the tops remain level to express the topographic transition from one end of the structure to the other. Similarly, the height of the screens varies in response to the topography as well as the position of the signage. The frames are reinforced laterally with cables, turnbuckles and carabiners as a reference to the Mountains long climbing history.